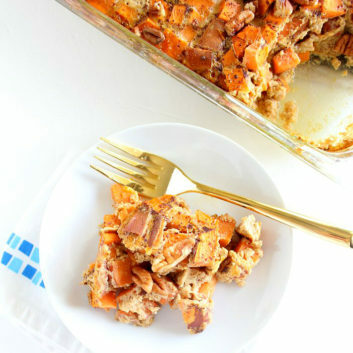 French toast meets pumpkin pie in this delicious (bread-free) breakfast dish. 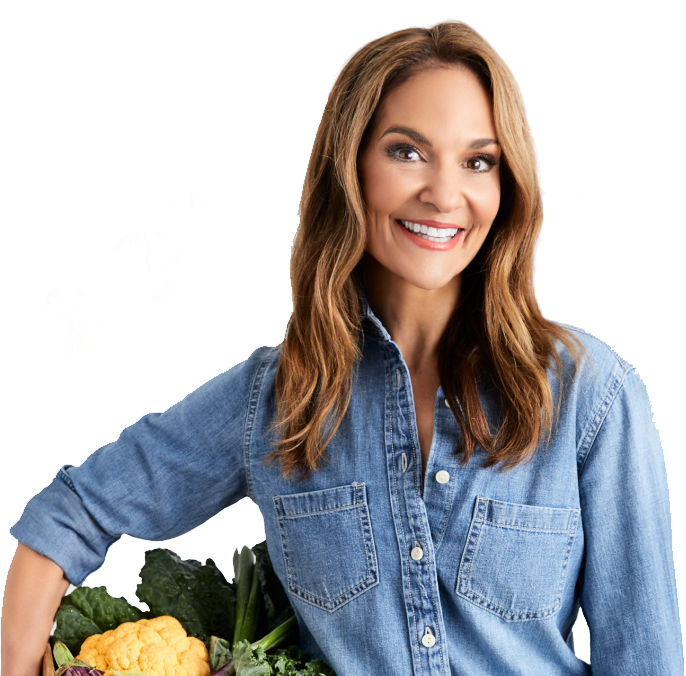 Instead of traditional bread, I swap in sweet potato, which delivers a dose of beta-carotene, potassium and fiber to help get you going in the morning. It’s like having dessert for breakfast. Get ready to dig in. 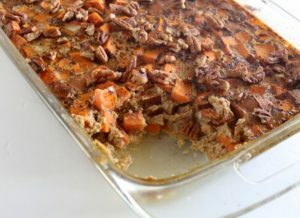 Place sweet potatoes in 9-inch x 13-inch baking dish and cook for about 25 minutes. In a large bowl, whisk together eggs, egg whites, milk, vanilla, pumpkin puree, pumpkin pie spice, and 1 tablespoon maple syrup until well combined. Pour over sweet potato cubes and push down with a spoon or your hands until it’s all soaked and mostly covered. Top with remaining 3 tablespoons maple syrup, additional pumpkin pie spice and nuts. Bake for 35 to 45 minutes or golden brown, firm and no longer wet. Serve immediately with additional maple syrup, if desired. Store leftovers in the refrigerator covered for up to a couple days.